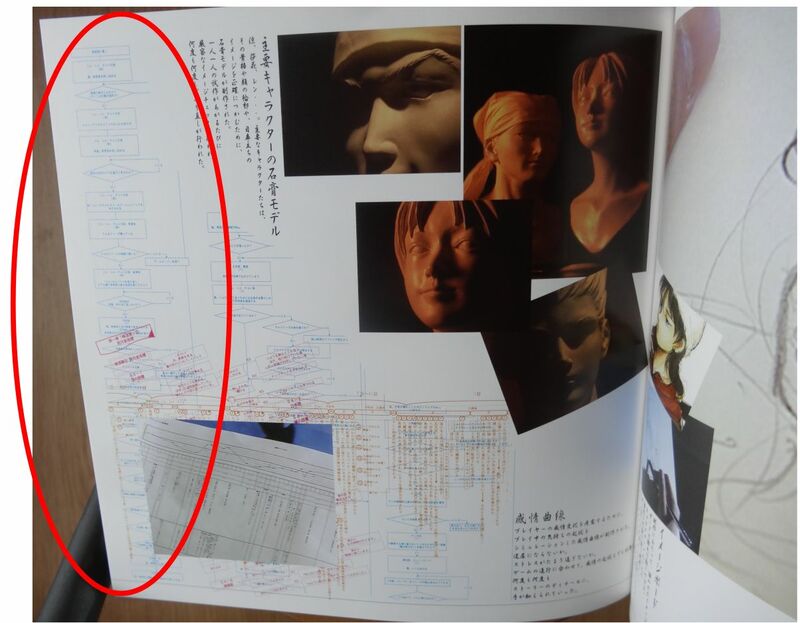 The "Making of Shenmue" section of the 1998 Shenmue art book contains snippets of actual design documents from the making of the first two games. We will be examining each of these in today's and future posts to see what information they reveal. This is a great opportunity to gain some additional insight into the early stages of the design of the first two games. 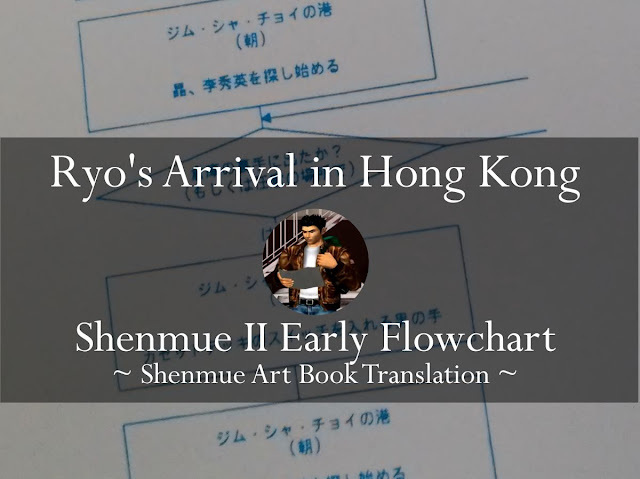 The document we will look at in today's post is an early Shenmue II diagram that steps through the initial plot in Shenmue II, starting with Ryo's arrival in Hong Kong through to meeting Xiuying in person. 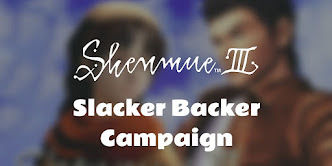 Plot elements relating to some of the initial events in Shenmue II will be discussed. The diagram appears at the side of a page in the art book, circled in red in the image below. It has been reduced in size, and part of the diagram is overlapped by other text and photos - all of which made deciphering it quite a challenge! 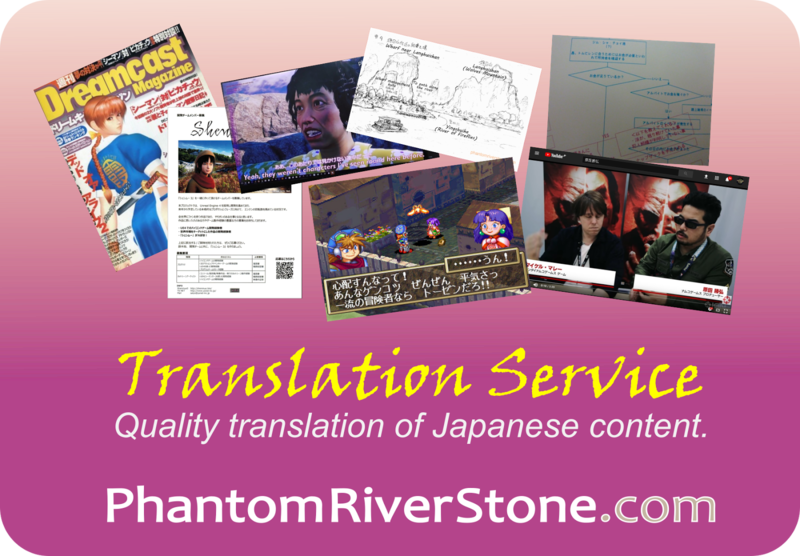 I have translated the visible contents as fully as possible. The flowchart covered in today's post appears here in the Shenmue Art book (circled in red). The text is tiny! 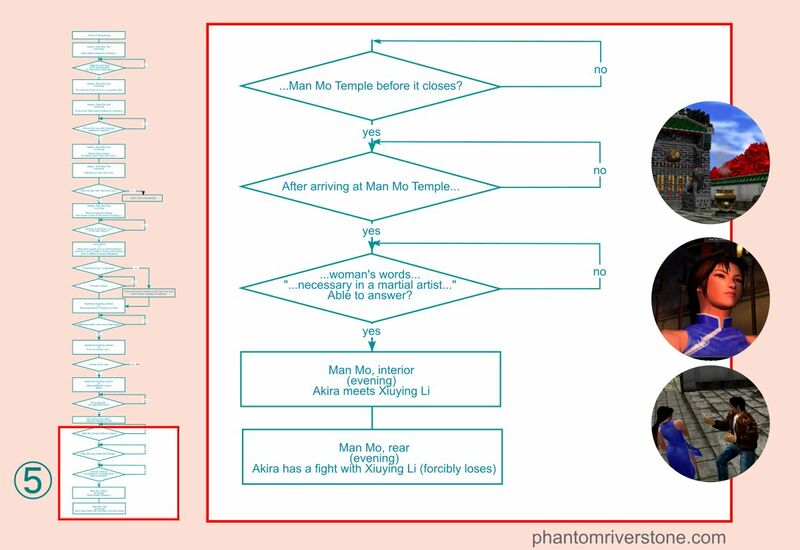 A flowchart diagram is a visual representation that describes a flow or process (in this case, the sequence of plot points and events in the story). It consists of symbols that are linked together by arrows. 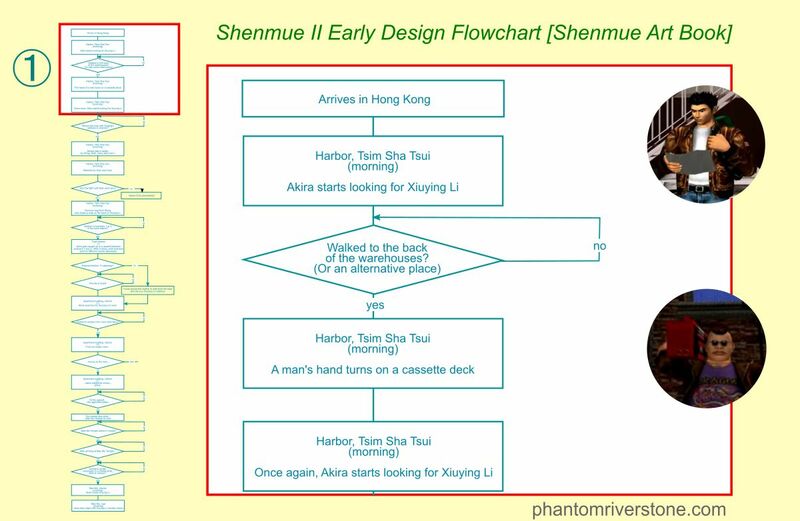 In the Shenmue document the main symbols used in the flowchart are a rectangle, which represents the progress of the story, and a diamond, which represents a question about the game state (there are two exit paths; the one to follow depends on the answer: one for "yes" and one for "no"). Due to its length, I have split it up into five pieces. So, let's get started with the first part. Note: some of the names differ from the final game (for example, Ryo is referred to as "Akira", a name which derives from Shenmue's original concept as a Virtual Fighter RPG). Although the diagram uses "Akira", I will refer to him as Ryo. 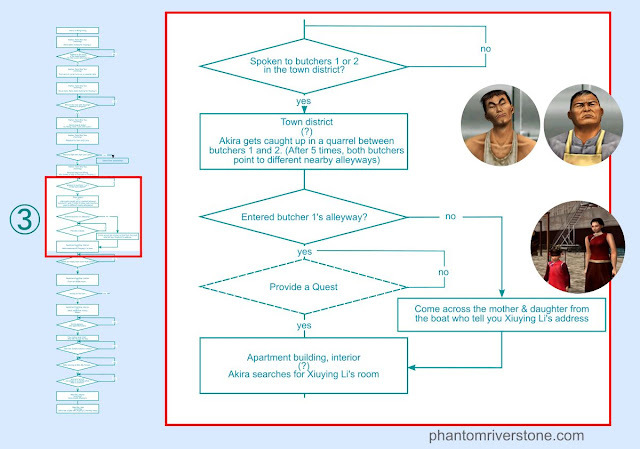 The first step in the flowchart has Akira/Ryo arriving in Hong Kong. The second step outlines his objective: finding a person by the name of "Xiuying Li". When he wanders into the area behind the warehouses, a scene triggers where "a man's hand turns on a cassette deck". "Tsim Sha Tsui": this is a shopping and nightlife district in real-life Hong Kong, and has a promenade which runs alongside Victoria Harbor. I don't recall this placename being mentioned in the release version of Shenmue II however. "Xiuying Li": in the final game, Xiuying's surname was changed to Hong. "A man's hand turns on a cassette deck": there is no further explanation, but what came to my mind is the cassette deck that is carried around by Cool Z. My guess is that this was intended to be a short cut-scene to foreshadow the encounter Ryo will later have with the Heavens gang. However I have not seen it appear in the release version. In this section, the story progresses when Akira/Ryo shows somebody the note bearing Xiuying's address. The morning after he does this, his bag will be stolen by Wong and the Heavens gang members. The following morning, he gets attacked by Sam and Larry but if he wins this he is able to retrieve his bag from Wong. Wong draws him a map showing him how to find Xiuying. The bag theft scenario can be recognized from the release version of the game, although here there is no option to chase and catch the gang members; instead, Sam and Larry later start a fight with Ryo. Cool J: outside Japan this character was renamed to Cool Z. 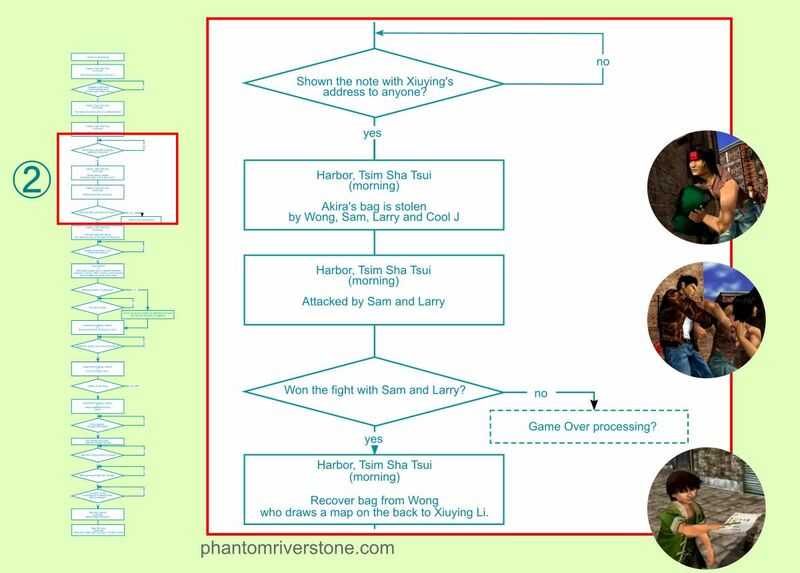 Game Over: it Ryo loses the fight with Larry and Sam, the diagram indicates the possibility of Game Over was being considered (although a question mark is attached). The release version avoids ending the game and instead offers several chances to recover his bag by further encounters with the Heavens gang members. The next plot trigger is when Akira/Ryo speaks to one of the owners of the two butcher shops. He becomes embroiled in their quarreling but eventually manages to get them to give him directions - which turn out to be different from each other. If he chooses to follow the road indicated by Butcher 1, the story will enter a Quest; if not, he will learn how to reach Xiuying's address thanks to the mother & daughter he met on the boat. After locating Xiuying's apartment building, he starts searching it to find her room. The Two Butchers: in the release version of the game, the two butchers are located in Wan Chai's Green Quarter (called "Town district" in the flowchart). They still do not get along with each other, but the planned scenario involving them helping Ryo to find Xiuying's apartment building has not been kept. However this helps us understand why they were specially included in the Characters section of the art book (see our previous post) with the accompanying question "In what way will Ryo become involved with them...?" "After five times, both butchers point to different nearby alleyways": this note suggests that this part of the game was intended to have been light-hearted, with Ryo having trouble getting proper information from either of the characters, requiring several attempts. 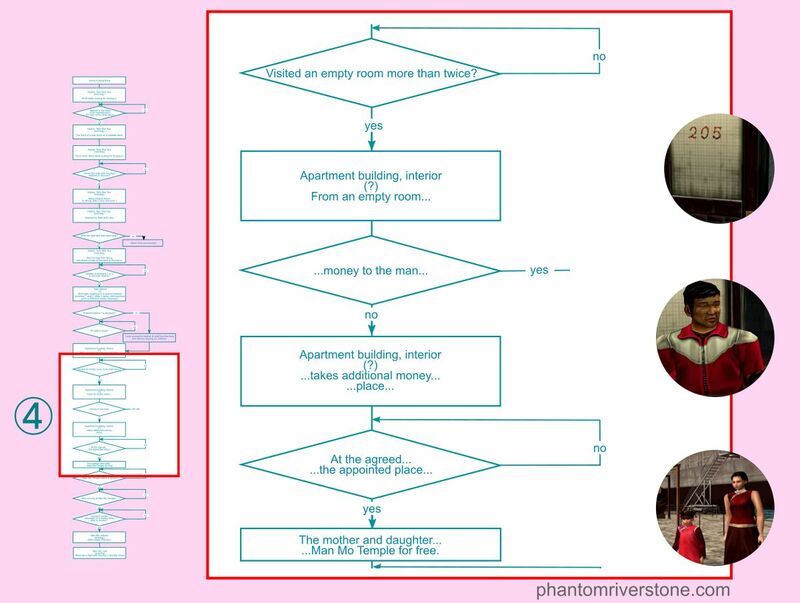 "Provide a Quest": this is a placeholder for some kind of quest that results in Ryo learning the location of Xiuying's apartment building. "Mother & daughter from the boat": in the release version of the game, after Ryo disembarks from the boat, a mother thanks him for taking care of her daughter on the ship and points out the Free Stay lodge. 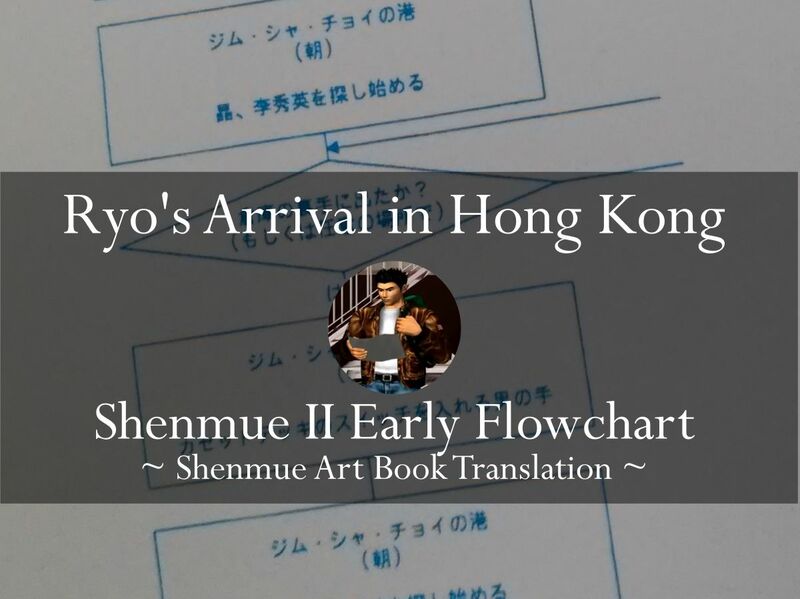 Many fans will be aware that the mother and daughter appear in an official side-story that was described in manga included with the Xbox version of Shenmue II: during Ryo's boat journey from Yokosuka to Hong Kong, Chai reappeared on the boat and took the daughter hostage. It is interesting to see from this document that further interaction had originally been planned for these two to help Ryo in his journey, but in the release version the interaction is limited to a conversation after leaving the boat. Note: the final two parts of the flowchart are partially obscured in the book. Truncated information is represented by ellipses "...". Ryo tries searching the apartment building for Xiuying's room without success. After he checks a few empty rooms, a man appears and requests money in return for information. If Ryo declines the man tells him to meet him later at another location with a larger amount. [? Best guess]. When Ryo arrives at the specified location, the mother and daughter reappear and direct him to Man Mo Temple - without asking for payment! A similar scenario appears in the release version of the game. The part regarding an "agreed place" is partly-obscured, but possibly the man tells Ryo to meet him again there, but this time the amount will be even larger than he had originally asked. Unfortunately some of the flowchart details are obscured here, but the gist can be understood. The mother and daughter from the boat make an additional appearance here. This time they give Ryo a lead to Man Mo temple, saving him from having to pay off the man. Ryo reaches Man Mo Temple and is able to enter during opening hours. A woman asks him a question relating to the martial arts, and the plot will not progress unless he is able to answer correctly. Once he gives the correct answer, he is able to meet with Xiuying in the evening. He spars with her, but finds himself unable to beat her. Again in this part, some text in the flowchart is obscured but enough remains to gain some sense of the meaning. The question posed to Ryo is presumably the same as in the release version of the game: to name the Four Wude. From the mention of "woman" it may have been that Xiuying asks him this question without revealing her identity (rather than Hanhui Liu as in the release version). The location of the fight with Xiuying takes place at the rear of the temple, but in the release version it is in the front courtyard. I hope you enjoyed this peek at an early game design document. If you recognized further parallels or differences with the published game, leave a comment below! A copy of the rare Shenmue art book is currently listing on Ebay, from our friends at Retro Import Gamer. The book is very hard to come by (and commands a sizable price when it does), so this is a great chance to pick it up at a reasonable level. Postage free within the UK! There is a portion of the game when your bag has been stolen that you can chase the Heavens individually. It is in Pigeon Park, and you have to choose to chase Sam, Larry, or Cool Z. Chasing Ren will end with him outrunning you. Chasing Sam or Larry ends in a free battle, but if you win, they take you to Ren at Lucky Plaza. Chasing Cool Z ends with a cutscene where he takes you to Ren at Lucky Plaza. Great write up, I always enjoy your articles! Thank you! It's interesting to compare the way that part ended up being handled, isn't it. The Larry/Sam battle idea was still used in a slightly different way, together with the other chase options. This is fantastic! Can't wait to read more. I plan to analyze another one soon! Excellent read. Who knew gems like these still are out there to be found and shared. Thanks! I've always wanted to share the details of these diagrams, but haven't had access to clear enough images until now. (Nice butcher-themed pun - not to mince words :D) Your comment on why these parts might have been chopped made me recall a 2001 interview that suggested it was a matter of capacity. Yu Suzuki said "A lot of scenes got left out, because right as we neared the end of development I added a whole lot of extra content. Even using the best compression techniques of the time, there was too much for it all to fit." 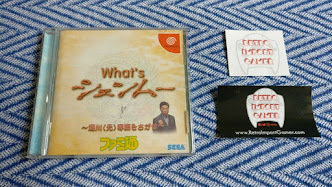 This was from an interview that I originally translated for the Shenmue Dojo. (I think I might post it up again here on the blog for people who may not have seen it).